There are 6 special enchants similar to Dark Lord Essence (must be put in card slot). They will give exclusive options when compounded on Angel Poring Boots and give crap option when compounded on other boots. If refine rate is 7 or higher, Atk + 2%. If refine rate is 9 or higher, Atk + 3%. Warning : this item can't be removed via card desocketing system. If refine rate is 7 or higher, Matk + 2%. If refine rate is 9 or higher, Matk + 3%. If refine rate is 9 or higher, reduces delay after attack by additional 5%. If refine rate is 7 or higher, reduces damage taken from neutral property by 2%. If refine rate is 9 or higher, reduces damage taken from neutral property by additional 3%. If refine rate is 7 or higher, increases long ranged physical damage by 2%. If refine rate is 9 or higher, increases long ranged physical damage by additional 3%. If refine rate is 7 or higher, increases critical damage by 2%. If refine rate is 9 or higher, increases critical damage by additional 3%. Increases EXP gained from killing monsters by 5%, increases drop rate by 5%. When equipped with Angel Poring Boots, increases EXP gained from killing monsters by additional 5%, increases drop rate by additional 5%. If refine rate of Angel Poring Boots is 12 or higher, reduces fixed casting time by 0.4 second. Increases EXP gained from killing monsters by 4%, increases drop rate by 4%. When equipped with Angel Poring Boots, increases EXP gained from killing monsters by additional 4%, increases drop rate by additional 4%. All Stat + 1, reduces SP consumption of skills by 10%. If refine rate is 12 or higher, increases movement speed. Drooping Gunslinger can be enchanted by using Gunslinger Scroll as enchant material. Gunslinger Scroll can be bought at NPC with 1m zeny or 2 Kitty Silvervine Fruits. 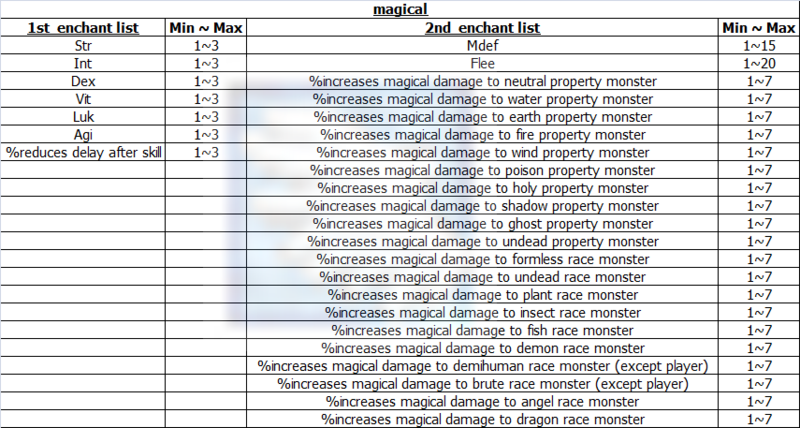 2 enchants will be given randomly as following table. If you get unwanted enchants. You can re-enchant it as much as you want as long as you have enough zeny or Kitty Silvervine Fruit to buy Gunslinger Scroll. However. 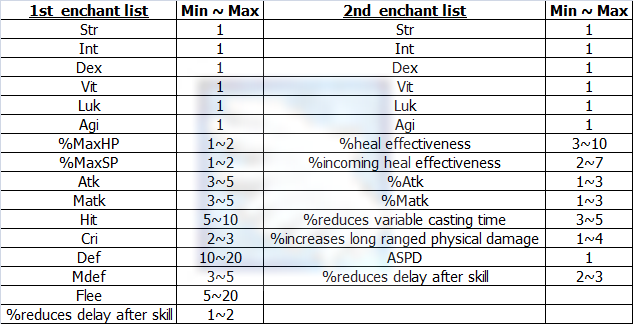 Enchantment will remove refine level and slotted card of Drooping Gunslinger. All Stat + 1, increases EXP gained from killing monsters by 5%. Sea Otter Mini Fan can be enchanted by using Fan Modification Kit as enchant material. Fan Modification Kit can be bought at NPC with 1m zeny or 2 Kitty Silvervine Fruits. If you get unwanted enchants. You can re-enchant it as much as you want as long as you have enough zeny or Kitty Silvervine Fruit to buy Fan Modification Kit. However. Enchantment will remove slotted card of Sea Otter Mini Fan. In addition. While enchantment. There is a low chance of transforming Sea Otter Mini Fan into Fur Seal Mini Fan. Fur Seal Mini Fan can't be enchanted by Fan Modification Kit. So that means you must find the new Sea Otter Mini Fan to process enchantment again. MaxHP + 100 and MaxSP + 20 per refine rate. If refine rate is 7 or higher, additional MaxHP + 3%, MaxSP + 3%. If refine rate is 9 or higher, additional MaxHP + 5%, MaxSP + 5%. If refine rate is 12 or higher, increases HP and SP recovery by 100%. Kafra Uniform can be enchanted by using Uniform Repair Kit as enchant material. Uniform Repair Kit can be bought at NPC with 1m zeny or 2 Kitty Silvervine Fruits. If you get unwanted enchants. You can re-enchant it as much as you want as long as you have enough zeny or Kitty Silvervine Fruit to buy Uniform Repair Kit. However. Enchantment will remove refine level and slotted card of Kafra Uniform. There are 3 types of Candy Bag Backpack : physical, distance and magical. Atk + 1% per 2 refine rate. If refine rate is 9 or higher, reduces delay after attack by 10%. If refine rate is 12 or higher, reduces delay after skill by 7%. If base level is lower than 100, increases EXP gained from killing monsters by 10%. If base level is 100 or higher, increases EXP gained from killing monsters by 4%. Increases long ranged physical damage by 1% per 2 refine rate. Matk + 2% per 3 refine rate. Each type of Candy Bag Backpack has it own enchant material, Candy Bag Blessing Scroll and must be enchanted with its own correspond enchant material only. If you get unwanted enchants. You can re-enchant it as much as you want as long as you have enough zeny or Kitty Silvervine Fruit to buy Candy bag Blessing Scroll. However. Enchantment will remove refine level and slotted card of Candy Bag Backpack. In addition, Candy Bag Backpack can combo with Indigo Rear Ribbon. When equipped with Candy Bag Backpack(physical), reduces delay after attack by 5%. When equipped with Candy Bag Backpack(magical), reduces variable casting time by 5%. When equipped with Candy Bag Backpack(distance), Atk + 4%. If Candy Bag Backpack refine rate is 12 or higher, All Stat + 1. Magical Booster can be enchanted by using Booster Amplifier as enchant material. Booster Amplifier can be bought at NPC with 1m zeny or 2 Kitty Silvervine Fruits. If you get unwanted enchants. You can re-enchant it as much as you want as long as you have enough zeny or Kitty Silvervine Fruit to buy Booster Amplifier. However. Enchantment will remove slotted card of Magical Booster. In addition. While enchantment. There is a low chance of transforming Magical Booster into Crimson Booster. Crimson Booster can't be enchanted by Booster Amplifier. So that means you must find the new Magical Booster to process enchantment again. In addition, both Magical Booster and Crimson Booster can combo with Violet Halo. Matk + 20, increases long ranged physical damage by 3%, increases critical damage by 3%. Additional Matk + 20, increases long ranged physical damage by 3%, increases critical damage by 3% per 3 refine rate. If refine rate is 11 or higher, reduces delay after skill by 4%. When equipped with Magical Booster, reduces variable casting time by 30%. When equipped with Sigrun's Wing or Sigrun's Wing , increases critical damage by 14%. When equipped with Dark Blinder or Dark Blinder , reduces delay after skill by 6%. All Stat + 1, reduces delay after attacke by 5%. If refine rate is 12 or higher, skill casting can't be interrupted. When equipped with Blush, increases heal effectiveness by 5%. Kitten Headdress can be enchanted by using Magic Cat Hand as enchant material. Magic Cat Hand can be bought at NPC with 1m zeny or 2 Kitty Silvervine Fruits. If you get unwanted enchants. You can re-enchant it as much as you want as long as you have enough zeny or Kitty Silvervine Fruit to buy Magic Cat Hand. However. Enchantment will remove refine level and slotted card of Kitten Headdress. Cursed Knight's Shield can be enchanted by using Silver Angel Idol as enchant material. Silver Angel Idol can be bought at NPC with 1m zeny or 2 Kitty Silvervine Fruits. If you get unwanted enchants. You can re-enchant it as much as you want as long as you have enough zeny or Kitty Silvervine Fruit to buy Silver Angel Idol. In addition. While enchantment. There is a low chance of transforming Cursed Knight's Shield into Bloody Knight's Shield and very low chance of transforming Cursed Knight's Shield into Purified Knight's Shield. Bloody Knight's Shield can be enchanted by using Cursed Blood as enchant material. Silver Angel Idol can be bought at NPC with 500k zeny or 1 Kitty Silvervine Fruit. If you get unwanted enchants. You can re-enchant it as much as you want as long as you have enough zeny or Kitty Silvervine Fruit to buy Cursed Blood. Purified Knight's Shield can be enchanted by using Gold Angel Idol as enchant material. Gold Angel Idol can be bought at NPC with 1m zeny or 2 Kitty Silvervine Fruits. If you get unwanted enchants. You can re-enchant it as much as you want as long as you have enough zeny or Kitty Silvervine Fruit to buy Gold Angel Idol. You'll notice that Cursed Knight's Shield and Bloody Knight's Shield have identical effects and enchants. In other word. If you get Bloody Knight's Shield. You'll no longer get Purified Knight's Shield which is better (has better effects and can be enchanted up to 3 slots) unless you enchant the new Cursed Knight's Shield. However. Enchant material cost of Bloody Knight's Shield (Cursed Blood) is cheaper than other enchant material by half. Victorious Wing Ears  can be enchanted by using Victorious Happiness as enchant material. Victorious Happiness can be bought at NPC with 1m zeny or 2 Kitty Silvervine Fruits. If you get unwanted enchants. You can re-enchant it as much as you want as long as you have enough zeny or Kitty Silvervine Fruit to buy Victorious Happiness. If refine rate is 9 or higher, increases Severe Rainstorm damage by 10%. When equipped with Ancient Hero Boots, when dealing physical damage, has a chance to gain Dex + 20 and increases bow damage by 15% for 7 seconds. Increases Axe Tornado damage by 10% per 3 refine rate. If refine rate is 9 or higher, increases Axe Boomerang damage by 40%. 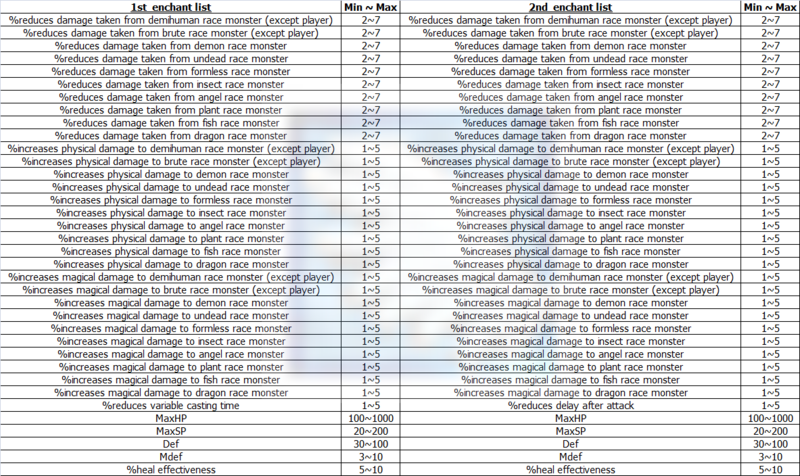 If refine rate is 11 or higher, increases physical damage against all size monsters by 15%. When equipped with Ancient Hero Boots, when dealing physical or magical damage, has a chance to gain Str + 20 and Atk + 15% for 7 seconds. When equipped with Ancient Hero Boots, when dealing physical d﻿amage, has a chance to gain Int + 20 and Matk + 15% for 7 seconds. If refine rate is 11 or higher, reduces cooldown of Earth Strain by 1 second. When equipped with Ancient Hero Boots, when dealing magical damage, has a 3% chance to gain Int + 20 and Matk + 15% for 7 seconds. If refine rate is 9 or higher, reduces SP consumption of Cart Cannon by 10%. If refine rate is 11 or higher, increase Cart Cannon damage by 15%. When equipped with Ancient Hero Boots, when dealing physical damage, has a 3% chance to gain Dex + 20 and increases long ranged physical damage by 20% for 7 seconds . Increases Sonic Wave damage by 10% per 3 refine rate. If refine rate is 9 or higher, when dealing melee physical damage, has a chance to auto-cast Sonic Wave level 2 (If user has higher level, that level will be cast instead). When equipped with Ancient Hero Boots, when dealing physical damage, has a 3% chance to gain Str + 20 and Atk + 15% for 7 seconds. Increases critical damage by 4% per 3 refine rate. If refine rate is 7 or higher, increases physical damage against demihuman and brute race monsters by 15%. 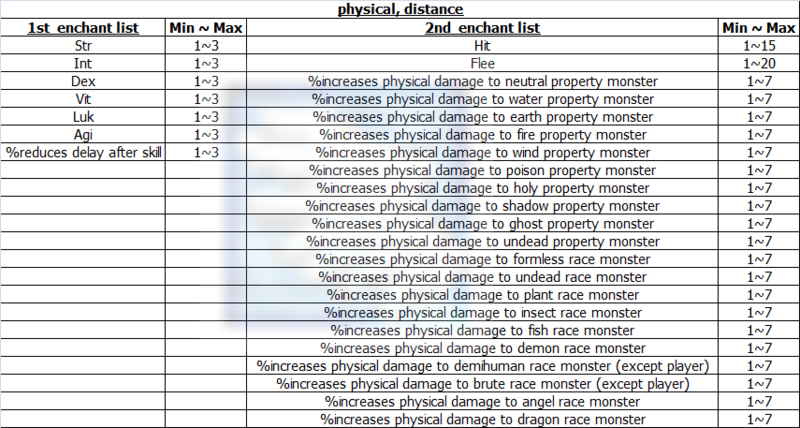 If refine rate is 11 or higher, increases physical damage against demihuman and brute race monsters by additional 20%. When equipped with Ancient Hero Boots, when dealing physical damage, has a chance to gain Luk + 20 and increases critical damage by 15% for 7 seconds. Increases damage of Duple Light by 25% per 3 refine rate. If refine rate is 11 or higher, increases damage of Duple Light by additional 30%. If refine rate is 7 or higher, increases damage of Cannon Spear and Vanishing Point by 15%. If refine rate is 11 or higher, increases damage of Cannon Spear and Vanishing Point by additional 20%. MaxSP + 2% per 3 refine rate. If refine rate is 7 or higher, increases damage of Prominence Kick by 15%. If refine rate is 11 or higher, increases damage of Solar Explosion by 20%. If refine rate is 7 or higher, increases damage of Espa by 15%. If refine rate is 11 or higher, increases damage of Eswhoo by 20%. Atk/Matk + 10 per 2 refine rate. If refine rate is 7 or higher, increases damage of Lunatic Carrot Beat and Silvervine Stem Spear by 15%. If refine rate is 9 or higher, reduces variable casting time by 10% and increases attack speed (reduces delay after attack by 10%). If refine rate is 11 or higher, increases damage of Picky Peck and Catnip Meteor by 15%. When equipped with Ancient Hero Boots, when dealing physical or magical damage, has a chance to gain Luk + 20 and Atk/Matk + 15% for 7 seconds. Increases attack speed (reduces delay after attack by 3%) per 3 refine rate. If refine rate is 7 or higher, ASPD + 1, Atk + 5%. If refine rate is 9 or higher, increases critical damage by 20%. If refine rate is 11 or higher, Cri + 20 and increases long ranged physical damage by 15% for 60 seconds when using Heat Barrel. When equipped with Ancient Hero Boots, when dealing physical damage, has a chance to gain Dex + 20 and increases long ranged physical damage by 10% for 7 seconds. Matk + 10 per 3 refine rate. If refine rate is 7 or higher, ASPD + 1, Matk + 5%. If refine rate is 9 or higher, has a chance to auto cast Soul Strike level 10 when dealing long ranged physical damage. If refine rate is 11 or higher, increases a chance to auto cast Soul Strike, has a chance to auto cast Soul Expansion level 3 when dealing long ranged physical damage. When equipped with Ancient Hero Boots, when dealing magical damage, has a chance to gain Int + 20 and increases ghost property magical damage by 10% for 7 seconds. If refine rate is 7 or higher, increases physical damage againt boss monsters by 10%. If refine rate is 9 or higher, Atk + 50 and increases long ranged physical damage by 10% for 90 seconds when using Platinum Altar. If refine rate is 11 or higher, increases physical damage against undead and demon race monsters by 15%. Atk + 15 per 3 refine rate. If refine rate is 7 or higher, increases damage of Dragon Tail by 15%. If refine rate is 9 or higher, reduces cooldown of Dragon Tail by 1 second. If refine rate is 11 or higher, increases damage of Dragon Tail by additonal 15%. Increases long ranged physical damage by 2% per 3 refine rate. If refine rate is 7 or higher, increases damage of Round Trip by 15%, increases SP consumption of Round Trip by 10%. If refine rate is 7 or higher, increases damage of Swirling Petal by 30%. If refine rate is 9 or higher, reduces cooldown of Swirling Petal by 1 second. If refine rate is 11 or higher, increases physical damage against fire and shadow property enemies by 15%, increases physical damage against undead and demon race enemies by 30%. When equipped with Ancient Hero Boots, when dealing physical damage, has a chance to gain Str + 20 and increases long ranged physical damage by 10% for 7 seconds. When equipped with Kiri no Tsuyu and Ancient Hero Boots, when dealing physical damage, has a chance to gain Str + 20 and Atk + 10% for 7 seconds. Atk + 10 per 3 of the sum of refine rate. Atk + 2% per 5 of the sum of refine rate. If the sum of refine rate is 14 or higher, increases damage of Cross Slash by 25%. If the sum of refine rate is 16 or higher, reduces cooldown of Cross Slash by 2 seconds. If the sum of refine rate is 18 or higher, enables to use Distorted Cresent which has the same skill level as Shadow Trampling user learned, enables to use Shadow Trampling which has the same skill level as Distorted Cresent user learned. If the sum of refine rate is 20 or higher, increases damage of Cross Slash by additional 25%. Ancient hero weapons can be enchanted by using Ancient Hero's Bravery (for physical type enchants) or Ancient Hero's Wisdom (for magical type enchants). Currently Ancient Hero's Bravery and Ancient Hero's Wisdom can be obtained randomly from March Kashua's secret box. If you get unwanted enchants. You can re-enchant it as much as you want as long as you have Ancient Hero's Bravery or Ancient Hero's Wisdom to process.